October is the time to plant bulbs in Utah. Both spring-flowering bulbs and garlic. It's best to do this in early or mid October. Sometimes we get snow in late October. There is nothing worse than trying to shovel snow off of the garden in order to plant in the cold mud! The local independent garden centers have many spring-flowering bulbs to choose from: tulips, daffodils, crocus, etc. When purchasing bulbs, more is better. You want the flowers to make a big statement in the spring garden. For example, 50 or 100 daffodils are not too many for a small (10' x 6') flower bed. The local stores also should have garlic bulbs available. Here is an older post I wrote about garlic. Here is another post I wrote about how to plant garlic. 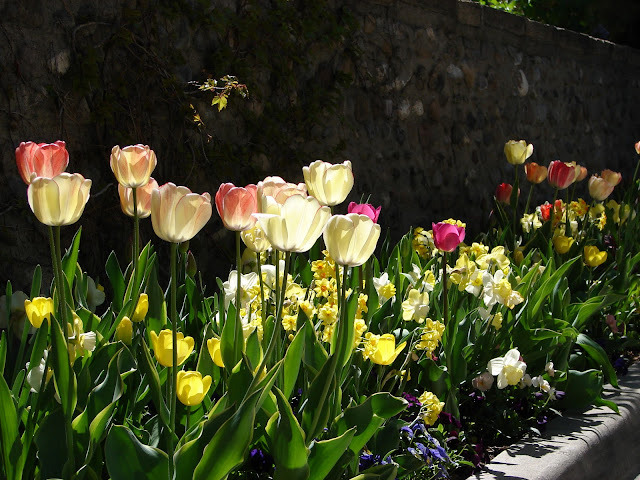 Tulips - plant bulbs in the fall for spring flowers! Spring Tulips in the Netherlands - More is Better! Fresh Garlic in Utah - enough to last all winter!